Hha-Lugh-Zhek, more commonly known as Lord Hollowjack, is a dread Daedra Lord who rules over the demi-plane of Detritus. He is also known as the Lord of Mortal Fears and the Fear Daedra. He is a unique Greater Daedra, a Pumpkin Spectre who derives supernatural power by metaphysically feeding on the terrified whispers of all Men and Mer who are driven by fear to pray for divine intervention. It is in this moment of dread that Hollowjack appears, speaking softly or in whispers from a mouth full of long, sharp teeth in order to carry out this "fear feeding". He has long, slender, and agile fingers tipped with sharp talons that can slash or puncture, but which are usually used to gently emphasize what the voice behind them is saying. Every year, during the Witches Festival on the 13th of Frost Fall, the portals between Nirn and Detritus open. As such, Hollowjack is closely associated with that festival, and it has become tradition for celebrants to masquerade as Hollowjack during the event. Hollowjack-style armor and weapons are crafted using pumpkin, black hawthorn, and amber marble. There is a long literary tradition of personal accounts and folk tales detailing the mortal victims of Hollowjack who were driven mad with fear due to repeated visitations from the Daedra. The Psijic Order have gathered a collection of these accounts as part of their studies on Oblivion, and categorize these individuals as "Hollowjack's Haunted". Hollowjack bears some similarities to Jaque o' the Hollow, a malevolent spirit said to haunt a hidden hollow in Rivenspire. 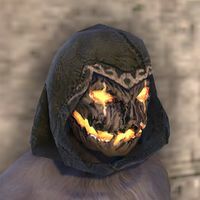 On the night of the Witches Festival, Jaque o' the Hollow curses riders all across Tamriel to ride headless throughout the night, clutching a carved pumpkin atop their mount. Carved pumpkins are sometimes known as Hollowjacks. This page was last modified on 4 February 2019, at 22:51.